Whoever said metal was dead, certainly has not heard Seattle, Washington’s GREYHAWK. The “Ride Out” EP is a crushing display in what excellent traditional heavy metal should sound like. Vocalist Rev Taylor often sounding King Diamond and Rob Halford, has outstanding range without ever once faltering. Guitarists Jesse Berlin and Enrico Marriuzzo show true chemistry between the duo. Bassist Darin Wall and Drummer Nate Butler are insanely tight and rhythmic. “The Abdication” is a perfect opener as it demonstrates the true spirit of metal. Rev Taylor’s vocals are soaring high, while Jesse and Enrico’s riffs pulverize the listener. “Ride Out” flat out is a reminder of why we love metal so much. Taking a page from Manowar, “Ride Out” has a chorus of epic proportions, and is certain to be a sing along among fans. Each tune just keeps getting exponentially better and better. “Serpent King” is by far the highlight of the album. Holy hell, Rev Taylor is in full King Diamond mode. The band just going full force with powerful riffs and ripping solos. “Wisdom of the Wizard” is 80’s metal incarnate. Drummer Nate Butler and bassist Darin Wall show tenacity and prove they are a worthy backbone to the band. Again, Rev Taylor’s vocals are truly exceptional and creates catchy vocal melodies. “Circle of Heroes” is one hell of a closing track. Get on your iron horse because this righteous tune is blazing fast and might gallop away. This is the epitome of true heavy metal, sky high vocals, crushing bass and drums, and riffs galore. GREYHAWK have created a monstrous EP in “Ride Out”. Sadly, tis only six tracks of fine heavy metal. Rev Tayor’s vocals are extensive as they range from Rob Halford to King Diamond. Jesse and Enrico display riffs and solos that still seem fresh and new. Darin keeps the engine running and rumbling while Nate always seems to add the right touch to each song. The only problem here, is that the album ends. 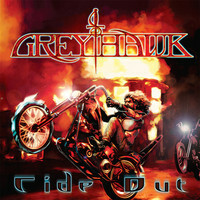 GREYHAWK are a band to keep on your radar and make sure to check out “Ride Out” whenever possible. Can’t wait to hear what they come up with next. For fans of Judas Priest, Manowar, King Diamond, Blind Gaurdian, and traditional heavy metal.